<Best Deal> Get both CE&EE Versions with Only $199! 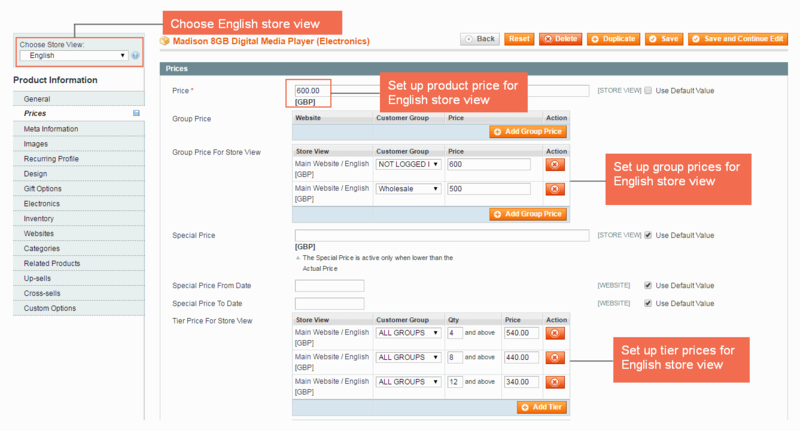 Magento 2 Multiple Store View Pricing is also available now! 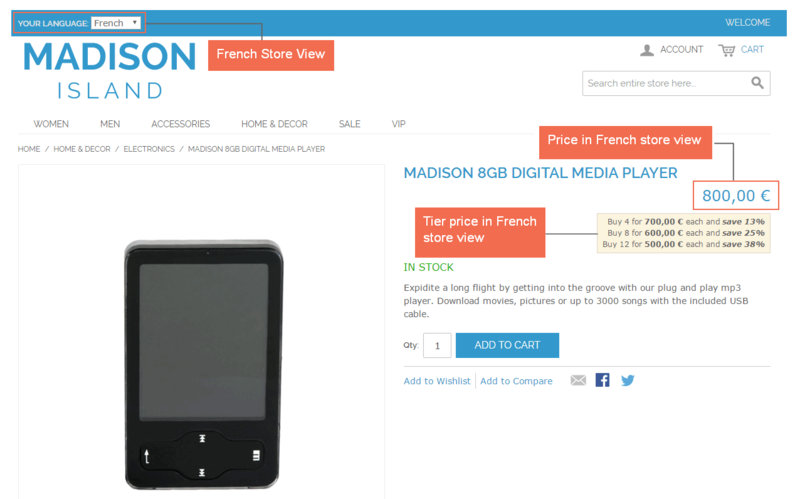 Magento Multiple Store View Pricing extension by BSSCommerce is a useful tool which allows online shop owners set and display different prices for each product in each store view of the corresponding store as wish. With this powerful Magento extension, now you will not face with any trouble in setting specific prices in multi store views for each same product. Therefore, you can attract specific customers from different store views by price policy as you want. * NOTE: When you purchase this extension, you absolutely get both CE and EE editions in one package. Therefore, you have more choices to select which version is matched with your website. It is also noticeable that we only offer Free support for ONE Magento installation. As you know, Magento default uses base currency of the website in the checkout. Therefore, this module help administrators to set up base currency for each store view and will support customers checking out with the currency of corresponding store view. 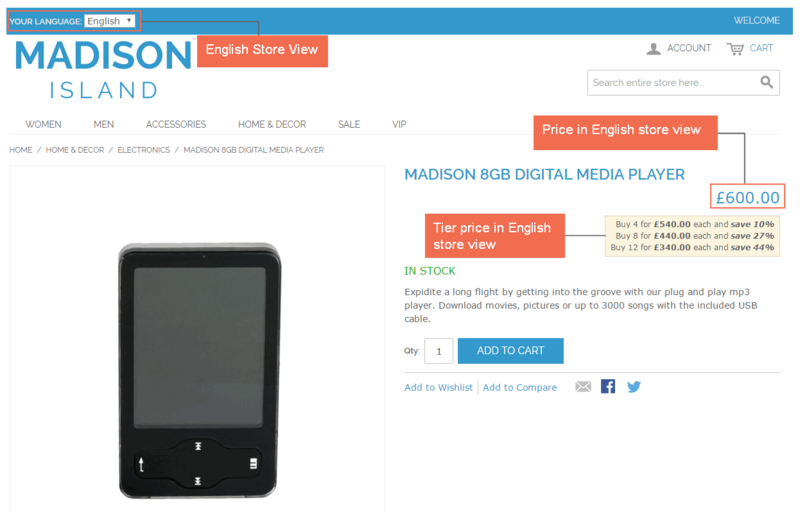 After that, when you set up price for a product in the English store view, you use British Pound Sterling as base currency and in the product page, the product price will be displayed with British Pound Sterling or any other currency (Display currency is optional). 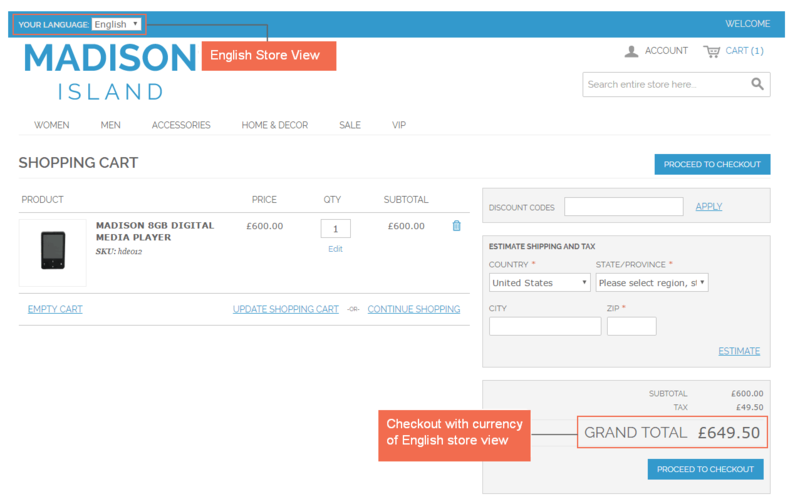 However, after adding it to cart, customers can only check out with British Pound Sterling currency (set up for English store view) instead of US Dollar as in Magento default. 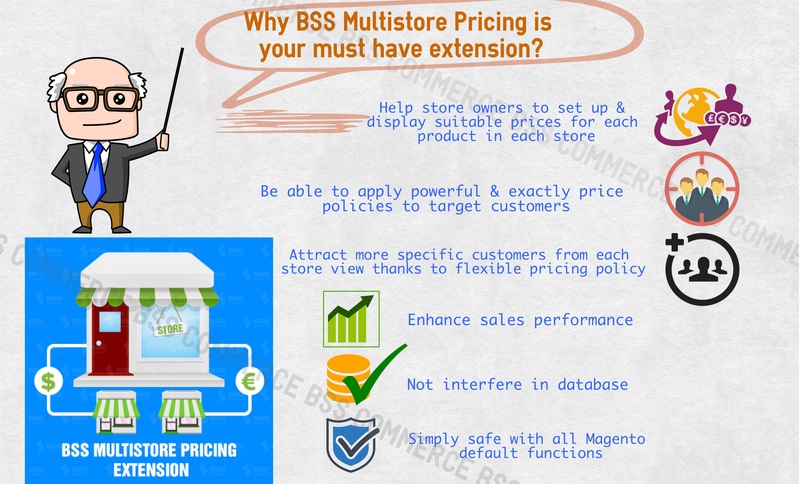 Why is Magento Multiple Store View Pricing Extension by BSSCommerce your must-have extension? Have you ever been worried how to make profits as the delivery, stocking costs or other material costs are added for almost the products when you have to keep the stable price for all store view of each store. The extension, however, helps you to deal with the products in the store that the extra cost is highly embedded. All you need to do is to set the suitable product price for each store view in the store, then your profit will not become "next-to-nothing"
In case of when you want to set promotion price for product only in one store view, it will be as easy as ABC when you get this extension. This extension has the function to set and edit special price policies per store view for specific products. It is ideal to set promotion campaign based on price for the particular store where there are special and unique occasions of surrounding environment. With various functions, you are able to apply different pricing policies of each store, which is powerfully attract more target customers from each store view about specific price policy. It creates effectiveness for your pricing marketing strategy. Of course, when you can attract more target customer and have a more effective marketing strategy, your sales amount will never let you down. With Magento Multistore Pricing by BSSCommerce, your sales outcome is on way to be boosted up. Unlike some other extensions in the market which potentially interfere in your Magento site's database and cause the change of code strings, which can make Magento default functions fail to operate rightly, Magento Multistore Pricing Extension by BSSCommerce erasers the problem because it does not interfere in site's database so it's simply safe with all Magento functions. Furthermore, it is well compatible with Magento platform. I think this extension is a smart solution to set up different prices for each store view. Setting is a little bit complicated by It is absolutely worth buying because of useful functions and it helps to solve a big drawback of default. Great extension, great support. I wish I had it earlier. This one has really helped our sales. This is really a very great extension for all website with many store view. I also like your features when setting base currency for each store view. It help me solve problems of currency betwen store view. Now customers are very satisfied because they can use their currency to checkout. I will support other work from BSS. Keep moving! This extension help me to do thing default Magento cannot. It have amany useful features for multiple store views. I like setting base currency for each store view most. Had an issue when installing the extension, support was extremely prompt and helpful. We purchased the plugin and it basically does what it describes. But it is not able to have different prices for the different configurations of a configurable product. The support confirmed that this is not implemented. So we ask for a refund which was denied. We have a plugin which is useless for us and are not able to return. Great support guys! I really fall in love with this extension!! I feel so exciting with your module's features because they totally meet our requirements. 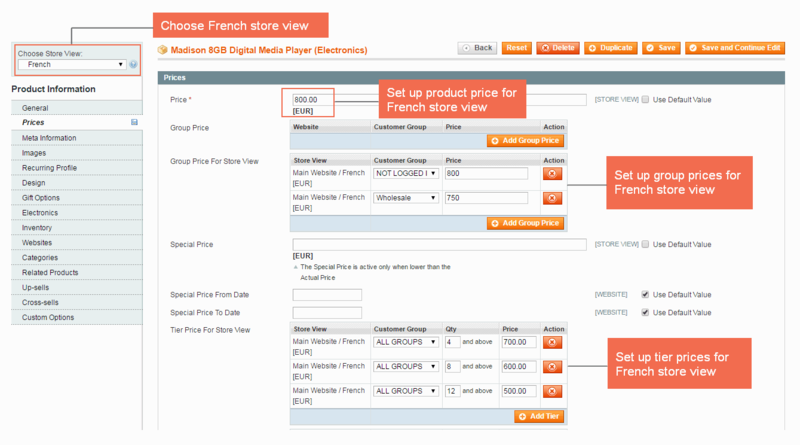 Now I can easily setup different prices, special prices for products on each store view. This module is so great and helps me to customize my pricing policy so much. I also appreciate your enthusiastic and professional support. Good jobs, guys! I highly reccomend this extension. it works well as introduction and the support team is helpful and really kind to me! thank you! I 'm new comer of Magento market. I've got some trouble with installing the extension. the support team here was great, kind and friendly. After installing this, it helps to increase sales! The extension gives me the ability to set different special prices for each store view in EACH STORE! Wow wow. interesting, buddy! Each storeview of each store, I'm definitely able to adjust the suitable prices for the same products. I love it so much! yeah! I've been tired from finding a Magento extension that helps me to set different prices for each product of different locations cuz' costs are different. Thanks God I found this! Wow, your module is more than I expect, it even includes some features that I never thought about before! Thank you so much!